A country doctor's search for his nephew becomes an unforgettable existential road trip in Kaili Blues, directed by a 26-year old Chinese filmmaker, Bi Gan. It's an ambitious, mesmerizing film that you'd never think it is the work of a first time director. I don’t think I’ll be seeing another film as audacious and beautiful as this one anytime soon. Chen (Chen Yongzhong) lives and works as an assistant doctor in Kaili, a sub-tropical region of southeast China. Through Chen’s sporadic conversation with the elderly woman doctor and with his irresponsible half-brother, Crazy Face, we gather Chen's past: he was in jail for taking the rap for his boss. His sickly wife died while he was incarcerated. Crazy Face resents the fact that their mother left Chen her house to continue housing the doctor's clinic to this day. Crazy Face's young son, Weiwei, neglected and locked up most of the time at home while he's out gambling, is in danger of being sold off, according to townsfolk. It's usually under Chen's care Weiwei eats properly and goes to school. One day, Chen finds Weiwei missing and discovers that Crazy Face has dumped him at his old boss's house who lives in nearby Zhenyuan, because he is fleeing Kaili in order to evade debtors and won't take the boy with him. The old doctor happens to have an old fling living in Zhenyuan, of whom she hasn’t seen since the days of the Cultural Revolution, and wants Chen to find him and deliver a shirt and a mix-tape she made for him, too. 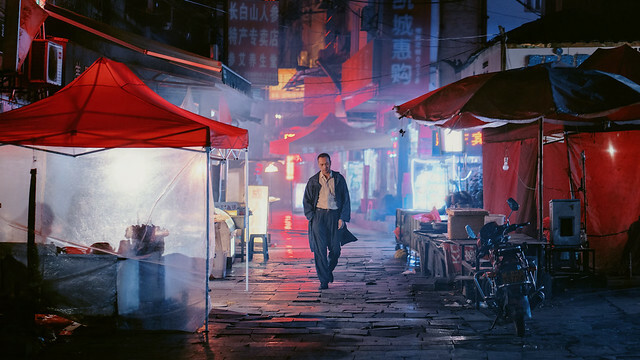 So begins Chen's dreamlike journey, where past, present and future are all mixed in with lush greenery and sinewy river system in picturesque Southern China. The 40 minute no-cut, wide angle traveling shot on a moped in the middle of the film is a legend in the making – it is a pure bravura filmmaking at its most playful and a feast for your senses. Wang Tianxing's fluid camera work is just as much a star in Kaili Blues. Even though all the scenes are exquisitely framed and every slow pan shot beautifully and meticulously composed, the technical aspect doesn't overshadow the overall lucid, mysterious, fantastic tone of the film. The camera freely moves from one conversation to another, often mingling with Chen's beautiful poetry (the director's own, I'm told) voiceover. I think of Kaili Blues as school of fish. All the small characters and stories and their connections are illusive, fluid and gone in a flash, but when caught, every one of those fishes are unique, shiny, slippery individual jewels. The only way to catch them is with a net and your hands in the water. This very loose and thin net, full of holes and tears, that Bi uses is made of seemingly unrelated recurring motifs -- Weiwei's hand drawn clocks, an old photograph of the old doctor's lover, motor bikes, a disco ball, a childish pop song -- and Bi deliberately doesn't catch them all. What's left is a palpable, lasting sensation of fish swimming and touching your hands as they get away from your grasp. I don’t want to pull ageism here but Kaili Blues doesn’t feel like a debut film of a 20 something director. If I had to compare it to the works of another filmmaker, I guess the film most resembles the films of Taiwanese master Hou Hsiao Hsien, particularly Goodbye South, Goodbye but with added lyricism and dreamlike quality. Infinitely wise and breathtakingly beautiful, Kaili Blues is definitely one of the very best films I've seen so far this year. Kaili Blues has an exclusive one week engagement at New York's Metrograph, starting on May 20.